Hope you aren’t sick of pumpkin yet, because these pumpkin chocolate chip pancakes are delicious. Full of flavor with very little sugar. The secret is that if you add enough flavor through the spices and vanilla, they will trick your mind into thinking you are eating something sweeter than it is. Even your kids will love them. My kids devour these pumpkin chocolate chip pancakes. Plus, they took almost no time to make. I actually mixed the dry ingredients the night before. That way, I could easily make them up in the morning. Who doesn’t like fresh pancakes for breakfast? Plus they make your house smell amazing! 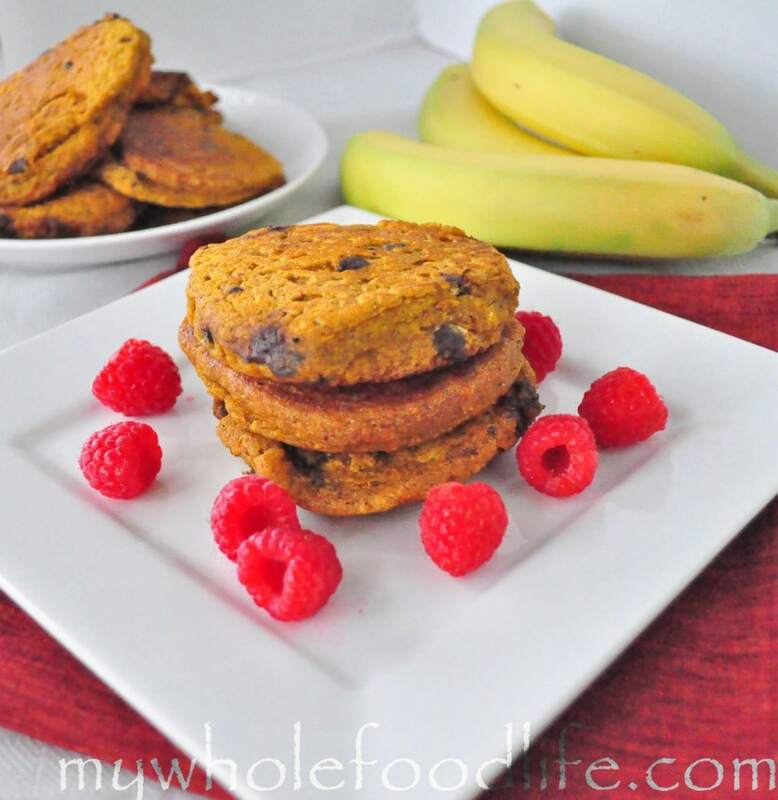 These pumpkin chocolate chip pancakes are vegan, dairy free and egg free. I hope you enjoy them. In a food processor , mix the milk, pumpkin, oil and egg until well combined. In a separate bowl, mix the flour, spices, vanilla and salt. Stir dry into wet being careful not to over mix. Fold in chocolate chips or any other ingredients you may want to add. Pecans or almonds might be good too. Using a 1/4 cup measure, scoop batter into a lightly oiled pan and spread it out slightly with a spatula. When you see the edges get brown, flip the pancakes over for another few minutes. This should make about 10-12 pancakes. Don’t worry about trying to eat them all at once. If you don’t, you can just freeze them in a zip lock bag and they should stay fresh for quite some time. Hi. I'm happy to find a recipe that uses spelt flour. I bought some for another recipe and don't really know what else to use it for. Pumpkin isn't really my thing nor are the spices you mentioned such as ginger, ground cloves and nutmeg. Can I substitute with 1 cup of mashed sweet potatoes? Is it ok to omit the spices? Thanks! You sure can sub sweet potato. You can also omit the spices, but they may taste a bit bland if you do. I am making these pancakes right now and you say this in the first paragraph: In a separate bowl, mix the flour, brown sugar, spices, vanilla and salt. Now in your list of ingredients you do not list brown sugar as one of the ingredients so how much am I supposed to be adding? No brown sugar. I used to make them that way, but took the brown sugar out of the ingredient list. Forgot to remove it from the instructions. Sorry! Thanks for your quick response but I ended up adding 1/4 cup packed dark brown sugar to my batter. OH MY GOSH are these amazing! I made a double batch for my family and will be freezing the leftovers like you suggested. Thanks! Great! We love them here too! Is there a reason you use ground vanilla bean vs. pure vanilla extract? I just like it. You can use vanilla extract if you want. I used extract this morning when I made a new batch and it worked great. I made these for breakfast this morning. I used organic milk and whole wheat flour. The family LOVED them. TY. Oh awesome! You are so welcome Laurie! These were a hit with my kids! YUM! Thanks for the great recipe! I made these today and they turned out AWESOME!!! They were so light and fluffy and super tasty!! Thanks so much for the awesome recipe! I love love love your blog! In the ingredient list you mention 1 T maple syrup. Is that supposed to go into the mixture when adding the spices, or is that just for putting on top of the pancakes after they are cooked? Thanks! It's supposed to go into the pancakes for a slight sweetness. I have made these several times; my family loves them! Thank you for this wonderful recipe! There are only 3 of us, so we don't eat them all, and it is wonderful to have the leftovers in the freezer. We just pop them in the toaster and - TA DA - delicious breakfast all over again!